Just like the Italians, the French take their food very seriously. In fact, food is closely linked to emotions and to how much (or how little!) you like or love someone. 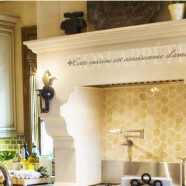 Indeed, Le flambeau de l’amour s’allume à la cuisine (The torch of love is lit in the kitchen). Bastille Day (the French National Holiday) is the perfect time to get those French cookbooks out. Don’t they just read like poetry? True, they’ll require a bit of work and preparation, but it’ll be well worth the effort. Impress your guests with a canard à l’orange (duck with orange sauce) or a classic and refreshing Salade niçoise if you’re looking for something lighter. Celebrate in style with a good bottle of red from Burgundy or Beaujolais and don’t forget to kiss the cook, or more poetically; Béni soit le cuisinier qui sert amour et rires (Bless the cook who serves Love and Laughter).